Example: send a fax to +17173613333@fax.tc where 717 is the area code, and 3613333 is the fax number. Step 3:Enter the fax contents in the message body, or attach a document to the email. See Attaching a File for instructions on attaching a file to an email message. Acceptable document types are PDF and any Microsoft Office Document. Attachments will be faxed in order of their attachmentTo fax both a message body and an attachment, enter /b at the end of the subject line of the message. Step 4:Click Send to send the fax. 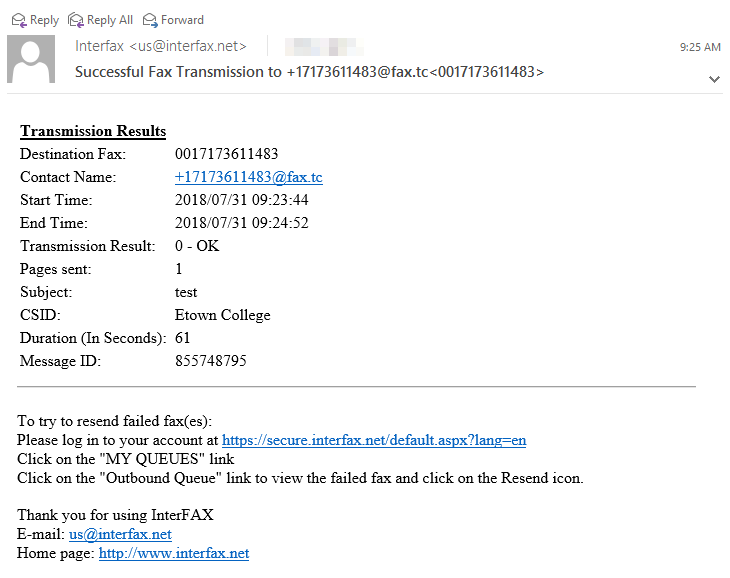 Confirmation Email:You will receive a confirmation email after the fax server successfully sends the fax. A copy of the fax is attached to the email message. In the event of an error you will receive a message containing the details of the error.